The Cisco® Aironet® 2700 Series of Wi-Fi access points (APs) delivers industry-leading 802.11ac performance at a price point ideal for plugging capacity and coverage gaps in dense indoor environments. The Aironet 2700 Series extends 802.11ac speed and features to a new generation of smartphones, tablets, and high-performance laptops now shipping with the faster, 802.11ac Wi-Fi radios. The Cisco Aironet 2700 Series sustains higher-speed connections farther from the AP than competing solutions. The result is up to three times greater availability of 1.3-Gbps rates in the Cisco environment for optimum mobile device performance and user experiences. 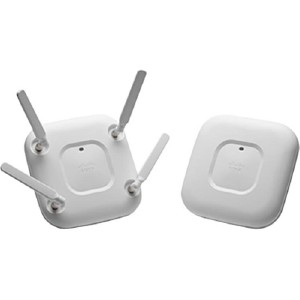 Cisco also offers the industry’s broadest selection of 802.11n and 802.11ac antennas, delivering optimal coverage to different deployment scenarios. Realize the full business value of your technology investments faster with intelligent, customized services from Cisco and our partners. Backed by deep networking expertise and a broad ecosystem of partners, Cisco Wireless LAN Services enable you to deploy a sound, scalable mobility network that fosters rich media collaboration. At the same time, you can improve the operational efficiency gained from a converged wired and wireless network infrastructure based on the Cisco Unified Wireless Network. Together with partners, we offer expert plan, build, and run services to accelerate your transition to advanced mobility services. Then, we help you continuously optimize the performance, reliability, and security of that architecture after deployment.